I never had cranberries with a holiday turkey when I was growing up. I think my family only knew of cranberries that came in cans, and since nobody liked those, they never made an appearance at our holiday table. It wasn’t until I joined a friend’s Thanksgiving dinner one year that I first saw and tried cranberries. I was still trained not to like them, but as a guest I felt obligated to at least take a tiny amount for show. Then, once they were on my plate, I thought I should at least try them. I was floored – they were amazing! Tart and sweet and tangy and delicious! Where had these been all my life?! I went back for seconds (okay, more likely thirds) and asked how she made them. Simple: she used fresh cranberries. Who knew? 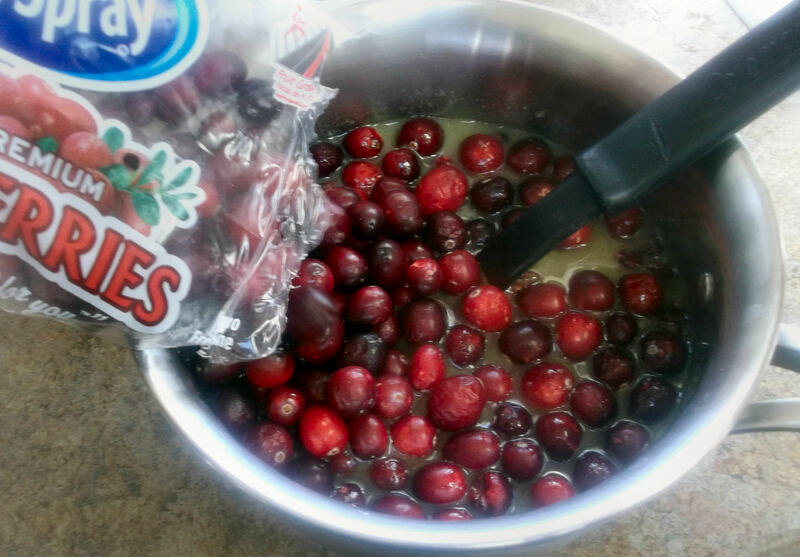 Well, my family sure didn’t, so when I made fresh cranberries for our very next Christmas, they were a huge hit. At long last, we have cranberries with every turkey now. Combine the cider or juice, applesauce, sugar and cloves in a medium saucepan and stir well. 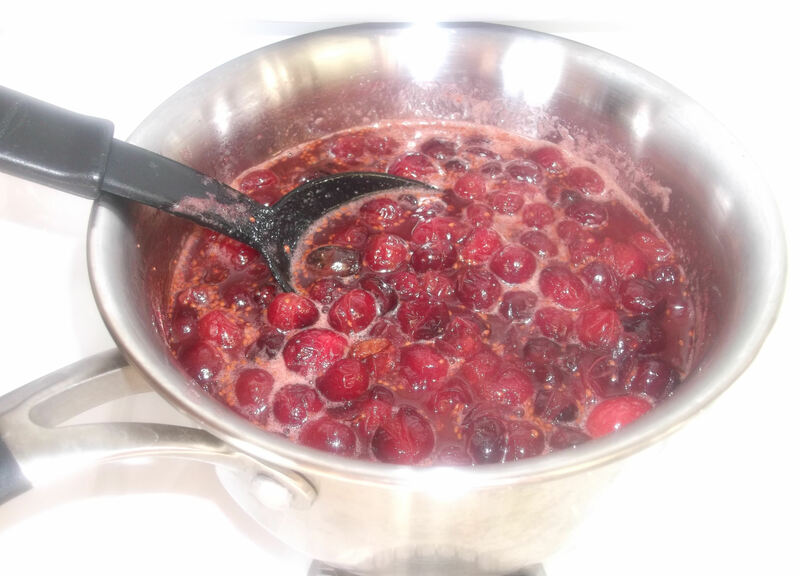 Stir in the dried and fresh cranberries and bring to a boil over medium-high heat, uncovered. Reduce heat and simmer, uncovered, 10-20 minutes to the desired consistency, stirring occasionally. Serve chilled. I love this recipe because it’s so easy – and so tasty! 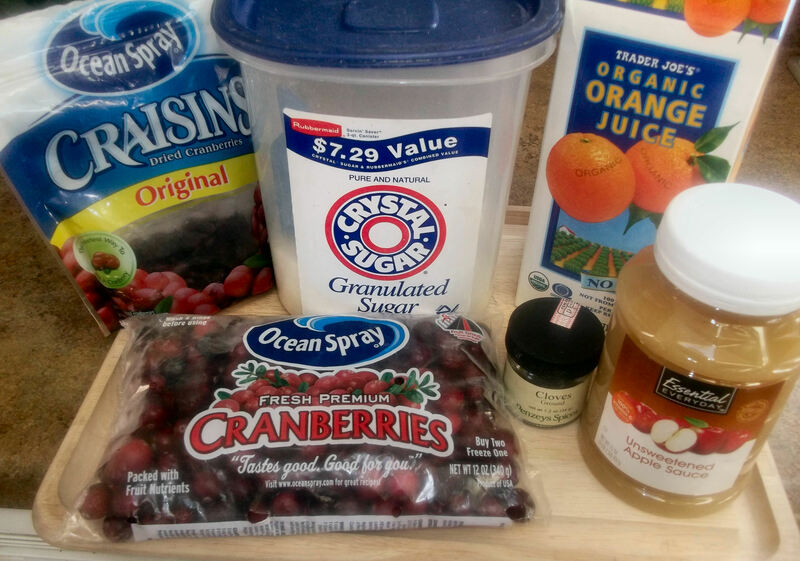 I add the “optional” ingredients if I have them on hand or remember to get them at the store when I buy the cranberries. They will still taste great, though, if you leave them out if you don’t want to make a special grocery run. In a medium saucepan, stir together the sugar (I use a heaping ½ C) with the liquid of your choice. 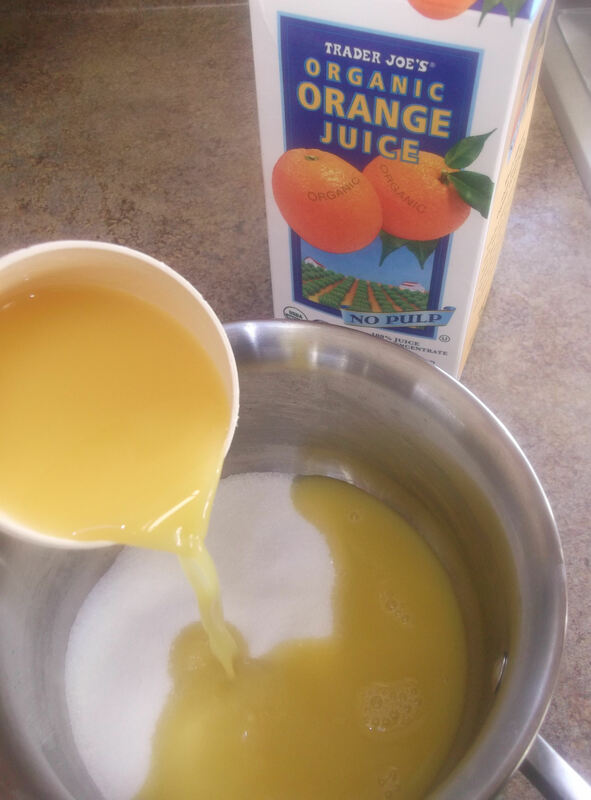 I had orange juice on hand already, but have made them with equally delicious results using apple cider. One year I had both on hand, and used one cup of each. Then add the cloves and applesauce. Stir it well, then add the dried and the fresh cranberries. I like using the dried ones for the color and texture difference they offer. 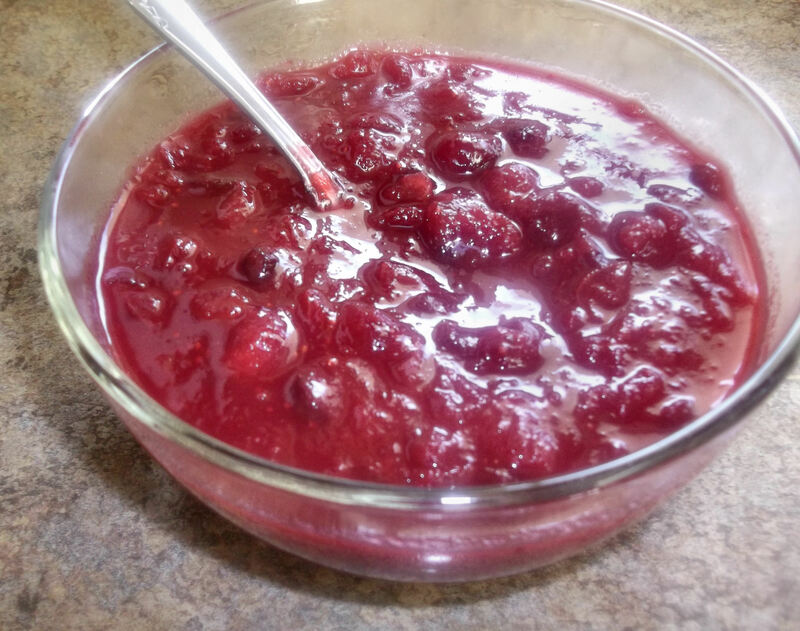 I ran low on fresh cranberries one year and had to improvise with the dried ones, but found I actually liked using some of both. Give a gentle stir to mix things together. Place the pan over medium-high heat until the mixture bubbles and boils. Leave the pan uncovered or the liquid will not be able to evaporate. There will be plenty left to be absorbed – trust me. I left my pan covered one time and it was a soupy mess. Tasty, but soupy. Once boiling, reduce heat to medium-low and simmer for 10-20 minutes, uncovered. You will hear the cranberries start popping now. Stir occasionally. Simmer until the mixture starts to thicken, and the cranberries start to lose their shape. Cook it to the consistency you like. If you prefer a thinner texture, like a sauce, simmer them for less time to retain the liquid. 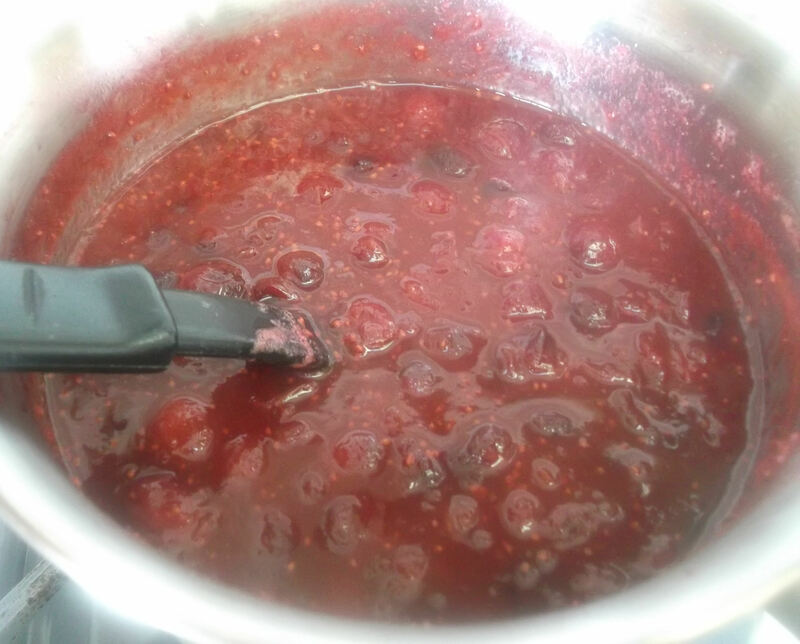 If you prefer a thicker texture, like a jelly, simmer them longer to reduce the liquid and further thicken it. I go about 15 minutes. 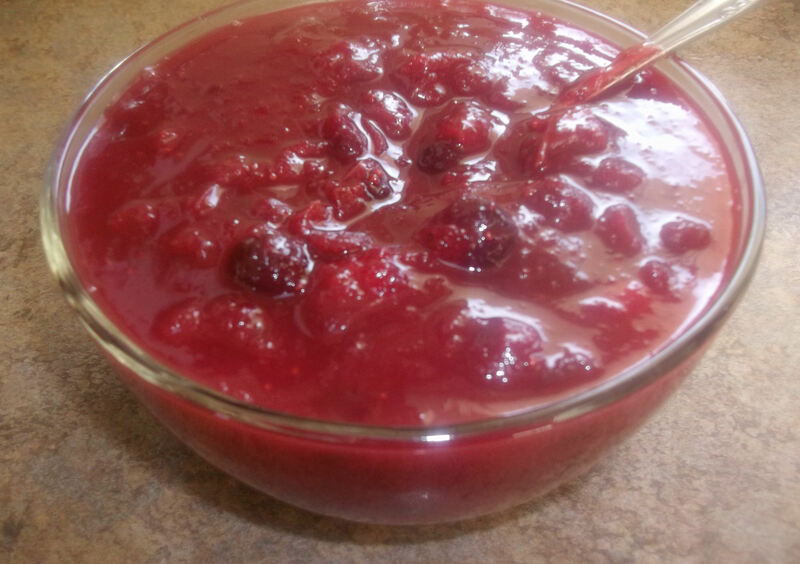 Allow the mixture to cool nearly to room temperature before transferring to the refrigerator. Serve chilled. Enjoy!